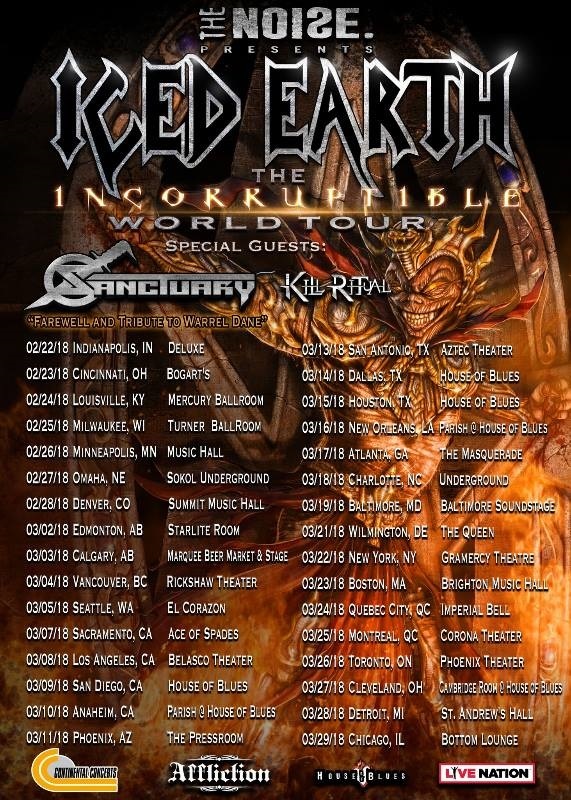 Following the unfortunate loss of one of metal’s most revered vocalists, Warrel Dane (SANCTUARY, NEVERMORE), prior to SANCTUARY‘s upcoming dates supporting ICED EARTH across North America, the band has announced the tour will go forth as planned. The shows will act as a farewell tour in tribute to the life and memory of Dane with guest vocals for SANCTUARY to be performed by Joseph Michael (WITHERFALL). SANCTUARY recently released the official prequel to 1988’s classic debut “Refuge Denied”, “Inception”, which showcased several previously lost recordings from their 1986 studio session that have now been restored, remixed and remastered by Chris “Zeus” Harris (QUEENSRŸCHE). Formed in 1985, the band was signed to Epic Records with the help of MEGADETH guitarist Dave Mustaine and released two records, “Refuge Denied” (1988) and “Into The Mirror Black” (1989), which saw them perform with the likes of MEGADETH, FATES WARNING, WARLOCK and DEATH ANGEL. The band disbanded in 1992 as members Dane and Jim Sheppard (bass) went on to form the highly successful metal act NEVERMORE with acclaimed guitarist Jeff Loomis. SANCTUARY reunited nearly 25 years later in 2010 and appeared at several festivals worldwide before returning to the studio to record their acclaimed full-length comeback album, “The Year The Sun Died”, for Century Media Records in 2014.